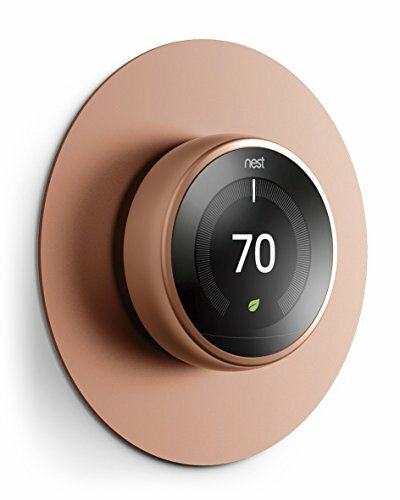 elago Wall Plate Cover for Nest Learning Thermostat [Bronze] - [Fingerprint Resistant Coating][Durable Aluminum][Easy Installation] - for 1st, 2nd, 3rd generation, and Nest Thermostat E by elago at Wakaf Center. MPN: ENET-ALPAD-BZ. Hurry! Limited time offer. Offer valid only while supplies last. DESIGN: The aluminum's finish complements your Nest Learning Thermostat perfectly creating a modern look that can't be beat. Each plate has an anodized finish and is sanded around the edges to give a nice feel. QUALITY: High quality aluminum, from Germany, is used to create a great look all while helping cool your Nest - aluminum metal acts as a natural heat sink. This grade of aluminum is used in airplanes, high-end bikes, etc. COMPATIBILITY: Our Plate cover works with all generations of the Nest Learning Thermostat; 1st, 2nd, and 3rd generations are compatible. Color options match up perfectly with the available Nest Learning Thermostat colors. If you have any questions about this product by elago, contact us by completing and submitting the form below. If you are looking for a specif part number, please include it with your message.